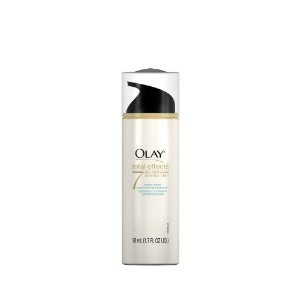 Olay Total Effects Moisturizer Plus Cooling Hydration is one of the various day and night moisturizers from Olay's Total Effects series. It targets 7 signs of aging: fine lines, wrinkles, rough texture, uneven skin tone, surface dullness, appearance of prominent pores, age spots and dryness. What makes Total Effects Moisturizer Plus Cooling Hydration different from the other Total Effects moisturizers is that it is formulated with a cooling effect. The moisturizer is oil-free, non-comedogenic, and is scented with a light floral note. The consistency of this moisturizer is light creamy, soft and smooth, but not too thin or too lightweight. It does give an instant quick cooling sensation on the face and leaves the skin well-moisturized without being greasy and sticky for my normal-to-dry skin. Most of all, it provides effective and long-lasting moisturization. I have been using it for over a month. It has enhanced the skin resilience, and made the face appear slightly firmer and more defined. The moisturizer helps minimize the fine lines and wrinkles, but not drastically. Since the texture is not exceptionally sheer or lightweight, Olay Total Effects Moisturizer Plus Cooling Hydration can be a little heavy for severe oily skin in hot and humid weather like the past summer. Overall, I think this moisturizer works great for dry skin, normal-to-dry skin, normal skin and combination skin all-year-round.